Hacha Y Machete (HYM Style) was the first official Massachusetts based professional New York Style “ON 2” Latin dance company. 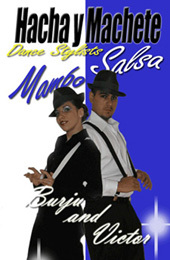 The company was formed in 1999 by a group of friends with the intent of enriching and educating New England about the New York Style of dancing salsa/mambo through our performances and classes. Under the direction of Burju Hurturk and Victor Perez the group has earned a remarkable reputation both locally and internationally for their innovative choreography, original style, and high caliber of dancers. Their dedication and passion has earned them spots on some of the world’s most prestigious stages such as the West Coast World Salsa Congress, the New York Salsa Congress, in some of the biggest night clubs in Boston, New York City, New Jersey, Rhode Island, Connecticut and Washington D.C., and along side well known salsa bands such as Sonora Carruseles and El Gran Combo. Today, Burju and Victor continue to direct their company with the original goals in mind. To enrich, educate, and promote a positive and inspiring environment for all salseros. To share their love and appreciation of the music and dance throughout the communities they reach.